In the previous chapter, you learned how to pass data from models to views using Session, Tuples and Dynamic (ExpandoObject). In this chapter, you will learn to pass data among models, controllers, and views using Render Action and Navigation Property in ASP.NET MVC. Render Action is a special controller method that includes partial view into main view page. If you want to display multiple models into a single view page, you can use Render Action Methods to do it. Step 1: Create partial page for each models and display models information on that partial page. Step 2: Now call all those partial pages inside a main view page using Render Action Method. 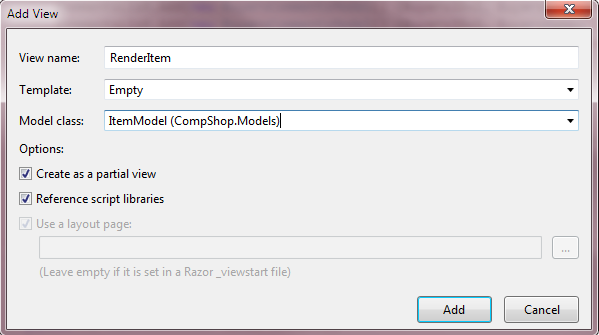 Step 2: Right click on RenderItem() and select Add View. Step 3: Select Empty Template and choose ItemModel for this partial view. Step 4: Open RenderItem.cshtml partial view and Add the following code in it. 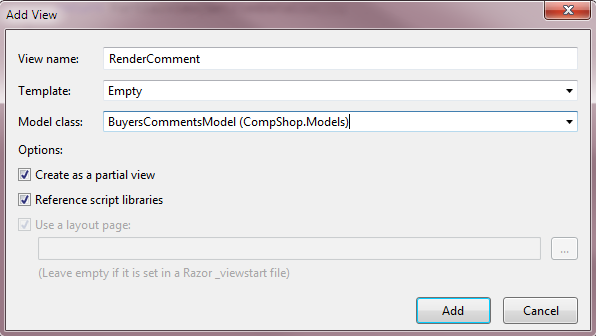 Step 5: Add the same partial view for RenderComment() Action method. 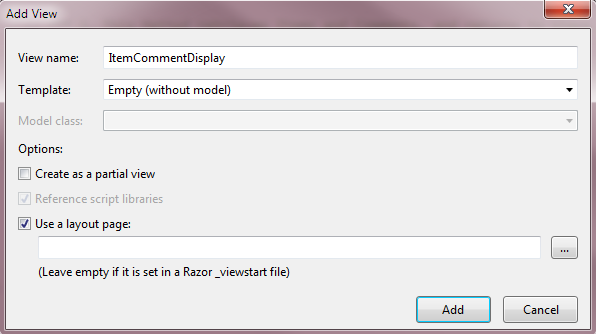 Step 6: Now add a main view page for ItemCommentDisplay() Action Method. Right click on ItemCommentDisplay() Action method and click Add View. Step 7: Add the following code in ItemCommentDisplay.cshtml page. Step 8: Press F5 and run the project. Navigation Property binds two or more related models. If two models are related then you can bind one model into another model as property. By binding models as property, you can access both models member by calling only parent model. I will bind BuyersCommentsModel as property inside ItemModel. 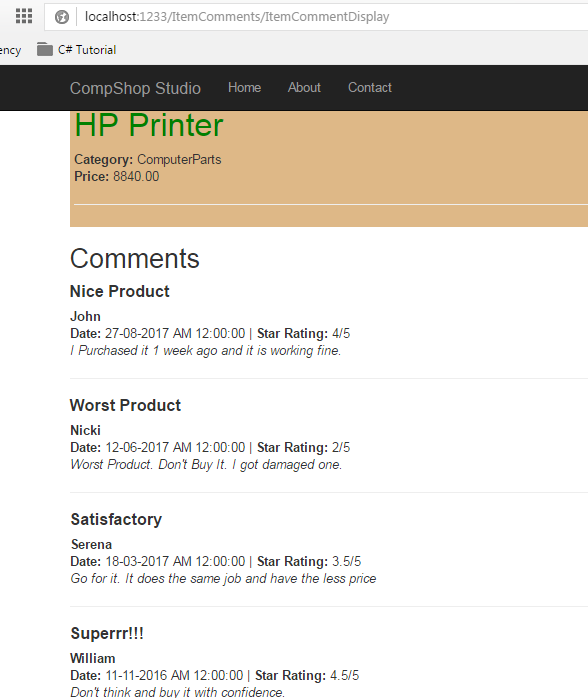 Step 2: Go to ItemCommentController.cs and update highlighted line in GetItemDetails() and ItemCommentDisplay() Action Method. Step 3: Go to ItemCommentDisplay.cshtml page and update it with the following code. Step 4: Press F5 to run the project. In this chapter, you learned how to pass multiple model data into a single view page using Render Action and Navigation Property. In this complete section, I taught you various ways to pass multiple model data into a single view page. I Hope that you will not face any problem in future when it comes to passing data between models and views. In the next chapter, I have added the very important topics of ASP.NET MVC and that is Working with Forms in ASP.NET MVC. If you cover the next chapter, you will be able to communicate with the database using forms in ASP.NET MVC.